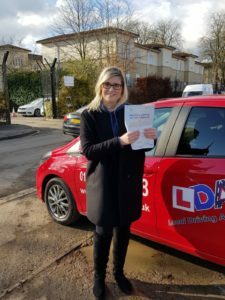 You’ve had all your lessons, you’ve passed your theory test and now you’re ready to take your driving test; but what you do when you arrive at the test centre? And how can you ensure that you have the best chance of passing your test? You are allowed up to 15 minor faults during your test, however committing any serious or dangerous fault will result in failing your test. Also committing more than 3 faults from one category count as a serious fault. Provisional licence including the counterpart. Ask you to sign the declaration form (DL25 FORM) to ensure you are UK resident, and the vehicle is ensured. Give you an eyesight test which involves reading the number plate of a vehicle from a distance of 20m. Will ask you 2 vehicle safety questions also known as “show me tell me questions”. When the examiner asks you to perform a manoeuvre he will show you where to do it and when. For example, he may ask you to drive to a certain location on the road and then do a full turn. He will give you an adequate amount of time to perform the manoeuvre, so take the time to plan what you are going to do and ensure that you carry out all the necessary safety checks. When your examiner is assessing your manoeuvre they will mark down a fault if you do not have full control of the vehicle, do not carry out the necessary safety checks or do not respond to other vehicles or pedestrians. You will not know which manoeuvres the examiner will ask you to do so it is important that you prepare by ensuring that you can do all of them successfully. Throughout the test, the examiner will check that you move off safely and that you are in control of the car by making sure that you use the mirrors correctly, check your blind spots, are aware of other road users and show that you can coordinate the use of the cars main controls. At the end of your test your examiner will add up these faults and this will determine whether you have passed or failed. 1a) Eyesight – There are no minors that can be incurred here but you must be able to read another car’s number plate. If you fail this, unfortunately it is an instant fail. Check on your first lesson whether you will need glasses when taking your driving lessons. 1b) Highway Code – Before embarking on your driving test you will have completed your theory test where you will have been a series of questions on the Highway Code. Although if you passed your theory test you will not be asked any further questions, you should still be fully aware of this code. 2) Controlled stop – Not everyone will be asked to carry out an emergency stop but if you do you need to follow the commands of the examiner and maintain control of the car at all times. In essence avoid the car skidding out of control. 3-5) Reverse – You will be asked to demonstrate that you can control your car by safely reversing to either the left, the right or into a parking bay. It is important to be observant at all times. 6) Turn in the road – This needs to be carried out slowly as many serious and dangerous faults can be made here. Not having control of the steering wheel can mean that you over steer and end up on the curb. Observation is key in ensuring that you are fully aware of other vehicles around you and what they are doing while you are manoeuvring. 7) Vehicle Checks – This is commonly known as the show me, tell me section of the test. Failure to answer one of the questions will result in a minor. 8-10) Taxi Manoeuvre, Taxi Wheelchair, Vehicle and Trailer Combinations – Not applicable for the standard driving test. 11) Precautions – Ensure that you are seated in the correct position to take your driving test. If you have taken a lesson prior to your test you will already have your mirrors and driving seat correctly adjusted. 12) Control – Avoid harsh steering and coasting (having the clutch depressed for long periods). 13) Move off – Demonstrate that you are able to move away from standstill smoothly and safely at all times. This is also applicable when moving off from a gradient in the road. 14) Use of mirrors – It is very common for minors to occur when you fail to check your mirrors when changing direction and speed. Ensure you check your mirrors as often as possible even if you feel there is not a need to. 15) Signals – The purpose of this section is to let people know what your intentions are. Always signal in good time allowing other drivers time to respond and once you have carried out your manoeuvre you need to put an end to the signal. 16) Clearance to Obstructions – Always allow plenty of room between you and other cars and potential obstructions. Always be fully prepared to stop if you see a young child run out or someone open their car door without giving you any prior warning. 17) Responding to signals – You will need to demonstrate that you can react quickly to all road markings and traffic signal. This includes reacting to traffic lights and obeying signals by traffic wardens, police and school crossings. In addition to this keep an eye out for signals from other road users and always be ready to act. 18) Use of speed – Act with care and always driving in accordance to the road conditions such as ice, fog and rain. Bear in mind that as a new driver you would have your driving license withdrawn if you are caught speeding and exceed six points or more in the first two years of driving. 19) Following distance – Remember to keep a safe distance from you and the car in front. If the roads are wet or icy the distances need to be increased. You need enough space to act if the car in front was to brake without prior warning. 20) Maintain progress – You need to show that can drive confidently at the appropriate speed and maintain this. If approaching hazards you must do so at a safe and controlled speed. Driving slow can also cause dangers just like driving fast can. 21) Junctions – The ability to judge your speed when approaching a junction and this includes roundabouts and safely stop the car in plenty of time. 22) Judgement – Using your judgement overtake cars if there is a need to always allowing plenty of room. Give extra room for cyclists as they can sway without notice. 23) Positioning – Try to avoid straddling over two lines and position your car on the road sensibly, keeping to the left where possible. If there are parked cars that you need to overtake, take the correct position quickly and safely. 24) Pedestrian Crossings – You will need to demonstrate that you are fully aware of the many types of pedestrian crossing and show consideration towards pedestrians at all times. If you see a crossing slow down and stop if there are pedestrians visible. 25) Position – When asked to bring your car to a standstill, find a safe and convenient place to bring the car to a safe standstill position. Try to avoid obstructing the road and potentially causing a danger to other road users. 26) Awareness – Be fully aware of other road users at all times and their actions. You need to plan ahead and try and predict how the other car users are going to react. Also take particular attention to vulnerable road users including cyclists, horse riders and pedestrians. 27) Ancillary Controls – Even if you don’t use all the controls in the car, you need to be fully aware of how they all work and when they are needed. These can include windscreen wipers, heat controls and indicators. You need to demonstrate that you can use these controls without the need to look down looking for them. 29) Health Declaration – If you have any health conditions that have changed since you originally applied for your license, then you will need to make the test centre aware of these before taking your driving test. 30) Residence – You can only take a UK driving test if you originate from the UK or European Economic Area or have lived in the country for at least 185 days in the last twelve months. Remember you will be asked to provide proof. Get in touch today for intensive driving lessons, regular driving lessons, refresher or automatic driving courses with an established, trustworthy, DSA approved driving school.